← Should Bordeaux Go Back to Less Ripeness & More Structure? In the 1954 film, On the Waterfront, there is a famous scene in which Marlon Brando says, “I could’ve been a contender. I could’ve been somebody.” I first saw that movie with my step-father, when I was a child, and did not understand the full impact of that scene. But when I looked up at his eyes and saw them filled with tears, I knew those words touched some deep regrets he may have had. Now, I have these same thoughts when I think about South Africa’s chance to make a name for itself in the US market. Three weeks ago, I attended a South African masterclass in New York City. 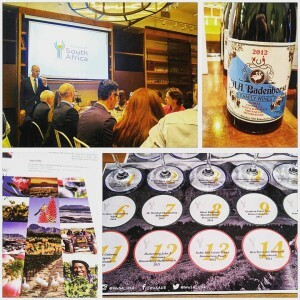 I have to admit that even as little as five years ago, I was not thrilled with the idea of tasting South African Wines. When they first hit the US market, they had gained a less than favorable reputation, but it is now said that the poor quality was due to hygiene issues that have since been almost eradicated. Some may remember that typical “rubber” note that was common with South African wines – South African wines I have tasted in the past couple of years have had that note. I actually tasted many wines during and after the masterclass and some were very impressive, tasting notes given at the end of this post. 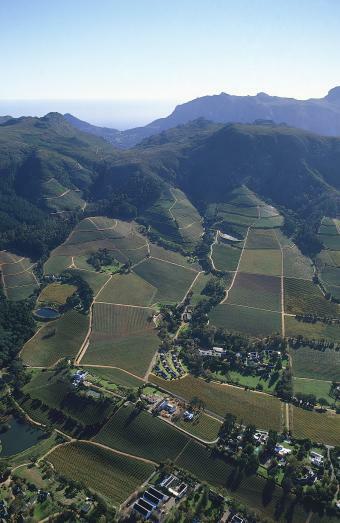 There is much to learn about South Africa as a wine region. One aspect, which I have been thinking about for weeks, is the idea that they missed out associating one variety with their country, such as Australia with Shiraz (Syrah) and Argentina with Malbec. Since South Africa was basically cut off from the rest of the world during Apartheid, they missed taking advantage of that trend. The longer I live and the more conversations I have with various people around the world, the more I realize that most people have had the feeling of regret at least once in their lives. One of the major differences between those who are content with their lives, as opposed to those not content, is the ability to find a way to let go of that regret and to focus on the present. It is a discipline that one needs to place effort into every day; if it were so easy to let go of regret, then everyone would do it. Stephen Hawking is a great example of someone who did not allow lost chances to get in his way of becoming one of the greatest minds of our time. Hawking is an English theoretical physicist and cosmologist who, in 1963 at the age of 21, was diagnosed with motor neuron disease. Even though he eventually became paralyzed, he did not allow that to stop him from not only continuing his research of the universe, but eventually communicating his findings to the world. As I observe the world I find with increasing interest how some can be given so much and still feel bad about their lives, and some can be given so little and be grateful for every little thing, and vice versa. It is truly a choice that we make everyday. Of course, I do not mean to make light of serious traumatic events that would break anyone’s spirit. It is a choice: either we take responsibility for creating our own opportunities and happiness or we don’t. It is fair to say that South Africa missed being able to associate itself with one variety. A signature wine is different from a signature variety in that a signature wine can be a blend, such as the classic sparkling wine that comes from Champagne and takes its name from the place. There is a well established trend in the New World that associates a single variety with a particular country, hence why to some, a signature variety is essential to succeed with exports. Those fast successes, like many fast successes, can end up causing detriment to a country’s long term success: Australian Shiraz being considered too much of a big fruit bomb and Argentinian Malbec being considered a quaffing wine that should not go beyond an entry level price point. Even beloved New Zealand is diversifying their plantings in case the whole Sauvignon Blanc craze ends. The above sweeping statements are unfair and do not tell the whole story of countries that produce wines of various styles and quality levels, but those are the stories that gave them international fame, and so those are the stories that are rooted in many consumers’ minds. Even though South Africa is playing catch-up in building an international brand, in a way, it was good that they waited, even if waiting was not by their own design. Some of us wine nerds may remember Pinotage as being the variety to represent South Africa, but it really was never that big of a player. Consider that in 2000, it only made up 7% of total vineyards (Wine Grapes as % of Total Hectares), and today is still only at 7% (it was uprooted in some places and planted in other more desirable soils in South Africa). Chenin Blanc is the most planted grape variety, occupying 18% of vineyards, trailed by Cabernet Sauvignon occupying 12%. Photo Credit: All copyright is with Wines of South Africa and photographer Klein Constantia. South Africa actually has many varieties planted because it has some of the most diverse terroir in the world – over 60 different types of soil exist. And it is common for the soil to change every three meters (nine feet) – this is the reason why there are so many varieties planted. Why is all of this important? Okay, let me follow a question with another question: what is currently one of the biggest trends in wine? I know there are many, but there is a growing trend of New World blends. Major brands are promoting them and they are great wines to sell because no matter the vintage, a producer can produce more consistency and balance. I was especially impressed with the blends from South Africa. What is great about blends from South Africa is that it is not a marketing ploy – it mainly came from quality minded producers having such diversity within the same vineyards that they had to plant different varieties to produce top quality wine. It is a natural result of their unique landscape. In the film, It’s a Wonderful Life, George Bailey was bogged down by the daily grind of his life and the regrets he replayed over and over in his head. He thought his life had no value until he was given the rare opportunity to see what other people’s lives would be like if he was never born. In a way, South Africa was going through so much turmoil that it took a while for them to truly realize the incredible potential of their land. They are now starting to live up to their glorious terroirs, but it is a matter of showing the world that their wines have more value than once thought, and we will see if their lost chances can become a benefit. Pure, pretty fruit flavors of fresh cherries and white peach with some toast notes and creamy texture that is balanced by a good energy on the palate. Lots of rich autolytic notes expressed by brioche (spent 3 years on lees and their tech sheet says to “enjoy within 3 years after disgorgement” with the disgorgement date being the 23rd of June 2015). It had an intense citrus peel note that was not too sharp but more rounded such as you can find in lemon confit. Good acidity and I believe this sparkler will open up in time. Langeberg Garcia is one of the smallest appellations, and a new wine to hit the US market. It is much more New Zealand in style than South African, and what I mean by that is that it has pronounced flavors of tropical fruits and herbaceous notes, and South African Sauvignon Blanc is typically more subtle in style. But the acidity is not as fierce as in versions from Marlborough, New Zealand. Pretty spicy note that indicate good integration of oak with honeysuckle notes and creamy texture that points to lees aging, only a small quantity is produced. Biodynamic practices, indigenous yeasts, no enzymes added. Touch of lanolin and a broad quality to the high acidity with rich apple pie notes. A more linear Chenin with laser acidity that shoots right down the palate carrying intense honey and quince flavors. A cool weather styled Chardonnay with dominant citrus fruit white stony minerality (not coming from the soil but more describing the restraint, elegant style of the wine) and faint hint of clove indicates a judicious amount of oak used. This wine has a similar restraint as the previous Chardonnay but more creaminess and texture on the palate and the fruit more vivid – golden apple. 100% stainless steel and so no oak used yet lots of lees stirring (battonage). A lush body with notes of honeycomb, dried apricots and white flowers with a bright finish. 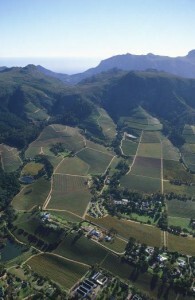 The Hemel en Aarde region is making a very good reputation for themselves as a producer of Chardonnay and Pinot Noir wines by pioneers such as Hamilton Russell and Bouchard Finlayson. A pretty Pinot Noir with bright red cherry with a light body, sweet spice and marked acidity. Smoke, dried herbs and black cherries with a nice balance and finesse that one would not expect from a Pinotage. A great example of what South Africa does best. Some much generous ripe fruit on the nose it makes one salivate yet the palate is refined and fresh. More structure than the previous Thelema 100% Cabernet Sauvignon, and I know that is odd, because you would think it would be the other way around, but sometimes place and winemaking trumps variety/varieties. Hedonistic wine with flavors of blueberry pie with an intense nose of cinnamon spice and velvety mouthfeel. At one time one could guarantee that a wine labeled with Shiraz was going to be in a more New World Australian style, and a wine labeled with Syrah would be more Old World Rhône. But that is not necessarily true nowadays, and this wine is a great example since it has Old World charm with savory flavors of bacon and dried herbs with juicy black and red fruit. Old World rustic charm with New World polish. Angular body with textural complexity of firm tannins that coat the palate with good amount of flesh to balance it out. This wine has the ripeness and generosity of the New World but with the elegant structure of the Old World. This wine was a revelation with a big, rich body balanced with marked acidity and an intoxicating flinty note. It is lush without being heavy, decadent without being vulgar…. a real lady who is in touch with her passion. A dark and serious wine, like Hamlet, with spice, black currant flavors and a wafting of purple flowers. A plush body that is round yet has good structure. A wine that draws you in and never lets you go. This entry was posted in Uncategorized and tagged Red Blends, South Africa, White Blends. Bookmark the permalink.